Because we cover all aspects of roofing and gutter work, we don’t just install roofs and gutters, we clean and maintain them too, so we understand what will contribute to the best roof & gutter solutions for your specific property and area. Our team’s industry experience and skills will save you time and money both now and in the long term. Once you have approved our quote and have provided us with a written work order, we will begin carrying out the work within one week. If a faster response is required please advise us so that we can endeavour to meet your schedule. We can repair or replace gutters and fascia on residential homes, strata properties or large commercial or industrial buildings to any height using various means such as scissor lifts, cherry pickers or scaffolding. Colorbond steel is a great, low maintenance Australian product. Many customers ask for their old tile roofs to be replaced with long-lasting Colorbond, and this can be done with little disruption. With new flashings and fascia boards, and a wide range of contemporary colours, Colorbond will modernize any roof and last for decades! Want more information about Colorbond? Whether you need roof cleaning, roof replacement or roof restoration, we are the team you can rely on. Call us today to discuss your project. 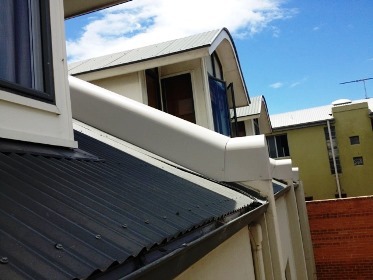 Older Victorian Homes benefit from beautiful COLORBOND parapet wrap capping to prevent leaks and deterioration.